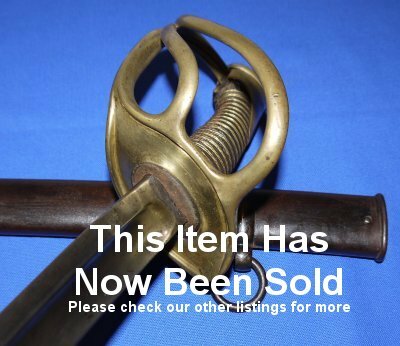 In very good condition (some apparent battle damage near the point), a French 1822 Modele light cavalry trooper's sabre / sword, dated September 1897. The sword appears to have been used in battle, probably during the Pacification of Algeria; there is a nick to the very forward cutting edge and some bending to the tip. Given any use of swords would have probably been used on someone on foot (an unmounted opponent), this is where you would expect to find damage and which damage is unlikely to be later horseplay (pardon the pun); later horseplay damage tends to be to the middle and / or forte section of the blade. This sabre also benefits from matching serial numbers to the hilt and scabbard, so they are both original to each other. 35 3/4 inch blade in good condition except for said battle damage to the tip area (such increasing rather than decreasing the value in our opinion). B;lade firm in the hilt. 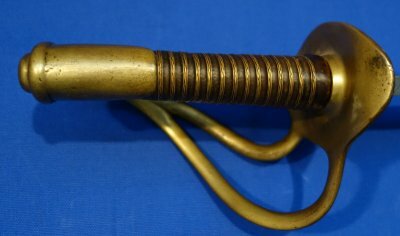 The brass hilt with some damage commensurate with having been in a battle environment. The leather grip and twisted grip wire bindings show signs of use and age but are complete and in very good condition for a service sword. Very nice example, under-priced at £(too late - but we will divulge the selling price for a small fee). Please quote reference number N63 (1324). Further / full sized images available upon request.